This condo is state of the art – from the kitchen, you can tell the bathtub to fill itself up at a specified height and temperature and it will call you in Japanese when it’s ready. It’s very star-trek. Because the manuals are in Japanese I mostly just guess at what the various control panels do. A wrong button push can summon firetrucks so I should probably stop doing that. I found the bathroom “burning hot mist” button by mistake. Do we really need a burning hot mist button is the question. What’s with the obligatory “minus ion” feature that every Japanese piece of hardware from the air conditioner to the hair dryer just has to have? Marketing genius I guess, because is sure isn’t science. 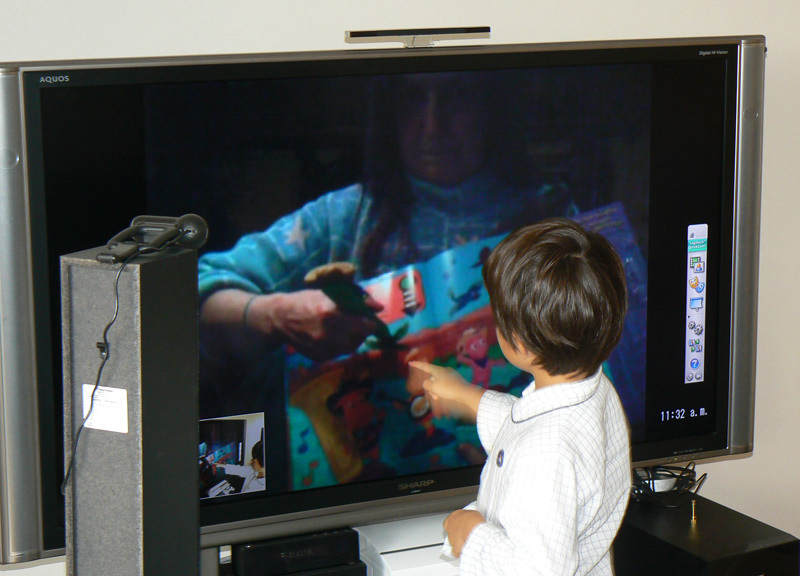 Living in Japan can be tough on grandparents.. but Skype to the rescue! Cosmo reads a book with Grandma. 5000 miles ain’t nothing. I brought up google voice search and spoke ‘Amazon Skeptoid book‘ and a few seconds later I had securely ordered it and had it happily on its way to her address. From bed. It’s a good time to be alive, folks. This entry was posted in Japan, Life on November 21, 2008 by Seth. congrats on the new home and mini person!! Name perhaps???? His name is Eon (an extremely long period of time.. ) – In Japanese, his name is drawn in kanji. Poor guy, as a second boy we’ve been through all this before so he doesn’t get as much fanfare and attention from us as our first. I probably won’t mention him again until he can code or do something useful. I like Eon. Will you call him E for short? Congrats on your almost new son! We didn’t know one was on the way. Dalton is horrible about keeping contact with anyone. In your picture with Grandma reading to Cosmo, brought back memories of the phonics video tapes that they use to make! He holds those tapes near and dear to him. When he wakes up,(yes, he games ALL night and sleeps until noon! Sound familuar? ), I will tell him you emailed back. He will be excited! He turns 18 in June and is graduating from Chemeketa’s high school completion course in March or April. Then he starts college this fall. Guess what he is going to do? That’s right, a game programer like Uncle Seth! He lives and breaths that dream…daily! Glad Dalton is considering game programming. He should check out http://www.ludumdare.com – a place where my friends and I are always happy to help out new guys on that epic quest… to make games! To carefully weave the web of an alternate world that can elevate the human race through play… or as others call it, making another crappy pac-man clone. But it’s all good.